Gereon Rath and Charlotte Ritter. Still from babylon Berlin. When I first set eyes on the Netflix ad for Babylon Berlin, I could not help but feel skeptical. I had indeed seen my fair share of mediocre, sensationalist, sloppy fictions and documentaries on Weimar Germany. Nonetheless, the trailer was enticing enough to prompt me to fall down that rabbit hole. A mix of historical fiction, political drama, spy story, and crime thriller, the series takes place in the spring of 1929, on the eve of a series of crises that eventually led to the fall of the republican regime and the advent of the Nazis in January-March 1933. The story follows Gereon Rath, a vice detective recently transferred from the Cologne homicide squad, and Charlotte Ritter, a young woman from the city’s working-class district of Wedding juggling a night job as a prostitute at a cabaret and her precarious stenographer position at police headquarters. The detective, who initially investigates the blackmail of an important Cologne politician by means of compromising pornographic pictures and films, soon ends up picking up the scent of a highly coveted wagon loaded with gold ingots. In the meantime, Ritter, who has made inquiries of her own, soon discovers that the bounty was originally stolen from the Sorokins, a Russian aristocratic family liquidated during the October 1917 Revolution. Originally in the possession of the Red Fortress, a Trotskyist organisation, the wagon attracts the attention of the Soviet secret service, a gang of Armenian mobsters, and a underground paramilitary group of far-right war veterans and ex-military personnel known as the Black Reichswehr. Occurring in the context of the Blutmai (Bloody May Day) riots, the Sorokin gold story appears more as an excuse to walk the uninitiated audience through the unstable political climate of the Weimar Republic than as a plot in its own right. This series is a success, offering a strikingly subtle kaleidoscope of late-1920s German society. Based on Volker Kutscher’s Gereon Rath Series, which comprises six books and an illustrated prequel (2017), the first and second seasons of Babylon Berlin follows rather faithfully the plot of the first novel, entitled Der nasse Fisch (The Wet Fish), published in 2008. Nonetheless, as often happens in book-to-film adaptations, the series discards major aspects of the novel and adds new plotlines, some of which only appear in the sequel, The Silent Death. In this case, the screenwriters’ and directors’ creative licence greatly enriches the story, as the novel, though well-researched and entertaining, reads like a one-dimensional thriller. As a result, Babylon Berlin focuses only partly on the police investigation per se, and is not as Gereon Rath-centred as the novel. Indeed, the adaptation successfully develops several ill-defined or peripheral characters, especially female ones. For one, Charlotte Ritter is more independent and cuts a more controversial figure than she does in The Wet Fish. In the latter, the young woman is not from Wedding, but from Moabit, another low-income area just north of Tiergarten, and little is known of her private life – see map below. In contrast, the series devotes more time to Ritter’s cramped, squalid living quarters, as well as to her impoverished mother, siblings, and abusive brother in law. By creating a more elaborate backstory for that character, the screenwriters have not only endowed her with more narrative depth, but also enriched the story with a striking illustration of working-class life in Berlin on the eve of the Great Depression. In addition, the choice to flesh out the elusive Svetlana Sorokina was most definitely an inspired move. One of the brains in the gold wagon scheme, the Countess – who falsely claims to be rightful heir to the Sorokin fortune – lives a double life as a crossdressing cabaret performer, while also working as a spy for the Soviet embassy. 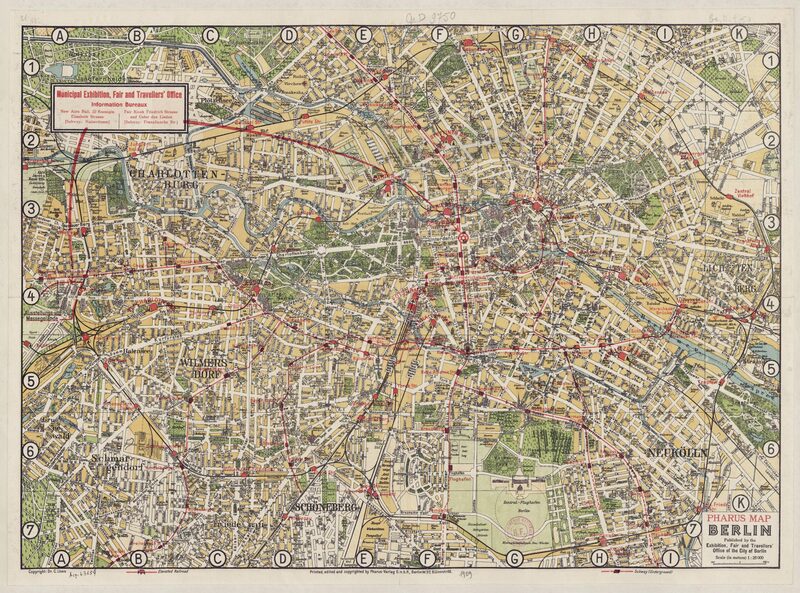 Pharus Map of Berlin, 1929 (BNF). This recourse to creative license also extends to the political atmosphere, which is ever-present but not fully explored in the book. The fourth episode, which focuses on the Blutmai and its consequences, wonderfully and subtly exemplifies the social tensions of the time, as well as the authorities’ trigger-happy response to popular protests. As a May Day specialist, I have to admit to being partial to that particular episode, whose writers and directors did not fall into the trap of Manicheism and demonization. In fact, the investigation into two deaths that resulted from police brutality is of no particular interest, except as a window into Weimar’s communist subculture on the one hand and, on the other, into the police’s reactionary elements. The latter find their embodiment in Bruno Wolter, a charismatic, ingenious Detective Chief Inspector, who also works for the Black Reichswehr and, as a former World War I sharpshooter, has maintained strong links with far-right paramilitary veteran organizations. In the course of the story his relationship with Rath transforms from that of mentor to foe, as both men close in on the Sorokin gold. Beside these storylines, several additional details and subplots add depth to the three main stories and provide the creators with supplementary avenues to explore. Thus, one finds elements from the sequel (The Silent Death), which incorporates the then-heated debates pitting the proponents of silent films against those rooting for spoken ones. Also worthy of note are the series’ masterful illustration of urban sprawl, subtle inclusion of technological innovations, such as the improvement and popularization of radio sets and the scientization of police work – e.g., improvements in ballistics and forensic pathology. But the most welcome addition to the adaptation certainly has to do with Gereon Rath’s backstory. In the book, the policeman was fortunate enough to have been drafted in late 1918 and to have avoided fighting in World War I. In contrast, the series’ writers gave Rath a past as a war veteran suffering from PTSD and addicted to morphine as a result. He also feels doubly guilty, as not only did his brother Anno disappear during a skirmish on the Western Front, but Gereon also began an affair with Helga, his sister-in-law. This change from the original version provides an extra layer of sophistication to the show, as it introduces uninitiated audiences to the then-polarizing subject of war survivors suffering from posttraumatic stress disorder. The latter became a politically-loaded issue in the interwar years, as the Social Democrats, the Communists and some Liberals tended to favour state-funded compensatory measures, while the Right dismissed the psychological impact of the war as weakmindedness or sheer cowardice. Given the context, Rath’s insistence on concealing his condition from the overly conservative Wolter should not come as a surprise. Thus, the series surpasses the novel by turning a somewhat formulaic thriller mostly centred on Gereon Rath into a unique foray into the heart of Weimar Germany. 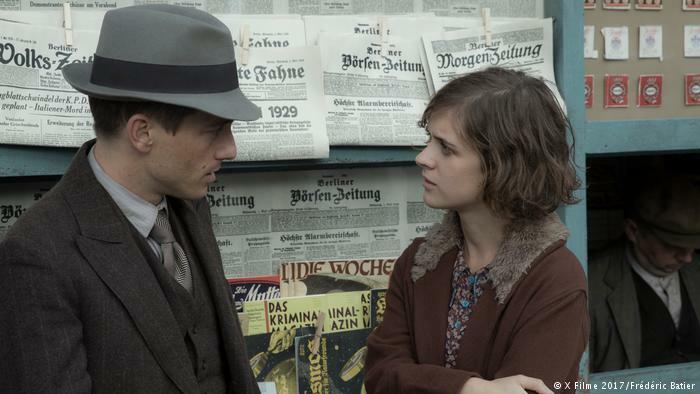 Whereas many adaptations tend to overemphasize the romantic aspects of the works they are based on, Babylon Berlin does not focus as much on the Rath-Ritter love story as The Wet Fish does. Aside from a brief kiss and a noticeable sexual tension, the two characters are mainly united in their desire to solve a series of murder cases and find the Sorokin gold. It is easy to surmise, then, that the writers aimed to keep a delicate balance between character depth and the era’s intricate political dynamics. While one might have expected a story dominated by snapshots of a decadent city, Babylon Berlin tends to qualify the overblown, hackneyed cliché of the capital as an oasis of fun and glamour. Although several episodes feature brilliant cabaret scenes and several baroque drinking-bouts and dances, the series often ventures into the city’s bleakest corners. By juggling the Berlin-by-night side of the story on the one hand, and, on the other, the urban environment as a lived-in space, the series efficiently vulgarizes and synthesizes many important points brought up by historians of the period. In his seminal Weimar Republic: The Crisis of Classical Modernity, Detlev Peukert observed that the period saw the interplay of four “generations,” namely the Wilhelminians (born in the 1850s 60s), the Gründerzeit (“founding era” of the Reich, 1871) cohort, the wartimers (1880s-90s), and the “superfluous” ones. In the series, the generational dimension is best illustrated by the Rath-Wolter relationship – defined by different experiences of the trenches. While the young detective belongs to the tail-end of the wartime generation, Wolter still has a foot in the old imperial Germany of the post-unification decade. Whereas the seemingly apolitical Rath seems to take the republican regime for granted, his mentor has little sympathy for his country’s leaders, whom he undoubtedly blames for the defeat. 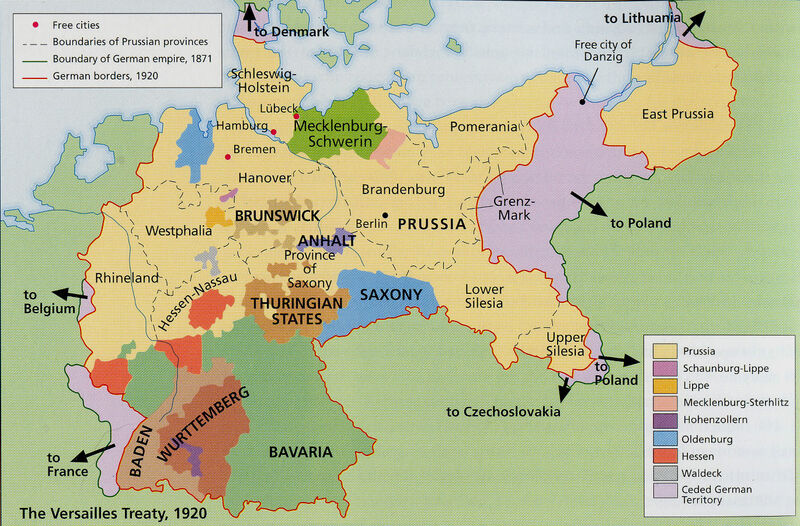 Germany in 1919, Territorial Losses – wlu.edu. Babylon Berlin is thus more than just an exciting thriller, as it clearly attempts to present a fresh, unpretentious perspective on Weimar Germany. What is of particular interest here is that the show does not engage in reiterating hackneyed commonplaces about the alleged similarities between the interwar era and our own. Conversely, one ends up being struck by the gulf that separates the 2010s from the 1920s, as the strength of Babylon Berlin lies precisely in portraying a Germany traumatized and embittered by a war of apocalyptic dimensions, a feeling that is quite foreign to the last three generations of Western Europeans and North Americans. The Weimar era was also one of open, violent political polarization – more so than our own. Many citizens wore their politics on their sleeves, sometimes literally, as some parties had their own paramilitary organizations, most prominently the Nazis’ infamous SA (Sturmabteilung – Storm Division); the Communist Roter Frontkämpferbund (Red Front-Fighters’ League); the pro-Weimar, Social Democrat-dominated Reichsbanner Schwarz-Rot-Gold (Black, Red, Gold Reich Banner); and the conservative-nationalist Stahlhelm (Steel Helmet). Progressive unions, like the left-wing ADGB (General German Trade Union Confederation) could boast more active, intransigent members than today’s unions in Germany or elsewhere. As for the opinion press, it was particularly virulent, with frequent diatribes on the front pages of the Nazi weekly Der Angriff (“The Attack”), the Communist Die Rote Fahne (The Red Flag), and the Social Democratic daily Vorwärts (“Forward”). Thus, although some aspects of that period might of course strike a familiar chord, Babylon Berlin tends (perhaps unwittingly) to side against those who predict a return of the 1930s. Finally, the series rightly emphasizes the multifaceted nature of Weimar politics, as it does not focus so much on the then-rising Nazis, but on other major players, like the Social Democrats, the conservatives of the DNVP (German National People’s Party), and the KPD (Communist Party). Indeed, while the Nazis had, by then, become a fixture in the north of Bavaria, they had not yet become a major player at the national level, which explains their relative inconspicuousness until the end of season 2. A key year in German politics, 1929 saw the parties that supported the republican regime begin to weaken and the rise of the Nazis. 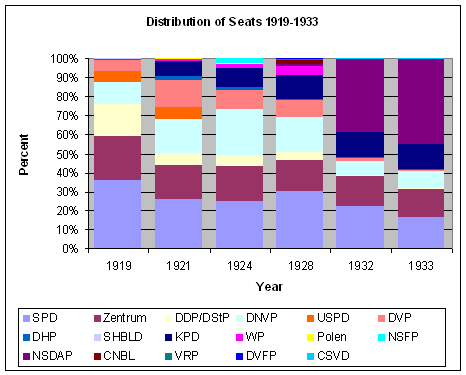 The first seasons of Babylon Berlin thus consist of a prelude to the regime’s agony, as the 1930 parliamentary elections marked a watershed, with the pro-Weimar parties’ combined strength slipping under 50%. The upsurge of the Nazis in that election (18% of the vote, as opposed to less than 3% two years before) resulted in part from a change of strategy initiated in 1929. Before then, Hitler’s NSDAP (National Socialist German Workers’ Party) had focused its efforts on the urban working class, mostly in vain. After successfully experimenting with a new programme designed for rural areas in some municipal campaigns, the Nazis decided to apply the same strategy to parliamentary elections. Babylon Berlin is commendable for several reasons. First of all, it did not fall into the “Nazi trap,” i.e., giving Hitler and the Nazis more importance than they actually had in the 1920s. Secondly, the series manages to convey the enormous impact of World War I on the interwar years. Well-crafted dialogue dispensed the writers from going through the trouble of giving a textbookish, dull, crash course on the 1919 Treaty of Versailles, which amputated 13% of Germany’s prewar territory and imposed (among other penalties and humiliations) a hefty reparation amount (132 billion marks) on the newly established, already flimsy republic. The political polarization and the rise of nationalistic and irredentist feelings are best exemplified in the scenes involving Wolter and his aristocratic and veteran friends, all proponents of the “stab-in-the-back” myth (Dolchstoßlegende), which claimed that the Jews, the moderate republicans, and the radical left had betrayed the rest of Germany during the war. Overall, then, Babylon Berlin will not only please interwar historians, but is also an excellent starting point for the uninitiated. The Reichswehr (literally, “Country’s Defence”) was the name of the German army during the Weimar Republic and the first two years of the Third Reich (1933-35). However, by 1929, the Black Reichswehr was a thing of the past, as it had officially disbanded in 1923. In police lingo, a “wet fish” is an unsolved case. See Jason Crouthamel, “War Neurosis versus Savings Psychosis: Working-Class Politics and Psychological Trauma in Weimar Germany,” Journal of Contemporary History 37, no. 2 (2002): 163-182. Detlev J.K. Peukert, The Weimar Republic: The Crisis of Classical Modernity, trans. Richard Deverson (New York: Hill and Wang, 1992), 15. Willy Albrecht, “Leonhard Tauscher und der Allgemeine Deutsche Arbeiterverein in Bayern,” in Von der Klassenbewegung zur Volkspartei: Wegmarken der bayerischen Sozialdemokratie, 1892-1992, ed. Hartmut Mehringer (Munich: K.G. Saur, 1992), 34-38. See for instance Benjamin Ziemann, War Experiences in Rural Germany, 1914-1923, trans. Alex Skinner (Oxford: Berg, 2007). Bernhard von Bülow was the Chancellor of Germany (1900-1909). Ludwig Yorck von Wartenburg was an 18th-19th-century Prussian general. Friedrich Ebert was a Social Democratic politician and the first President of Germany (1919-1925). Paul Singer was a prominent 19th-century Marxist Social Democrat. Volker Kutscher, Babylon Berlin (London: Picador, 2017). Thanks for this take on the show. It’s been on my list for a little while and I’m glad to hear it will be a worthwhile watch. Very helpful article for me with no knowledge of the era beyond Cabaret. Having read the first three books of the Gereon Rath series I beg to differ on this assessment: “The series surpasses the novel by turning a somewhat formulaic thriller mostly centred on Gereon Rath into a unique foray into the heart of Weimar Germany.” I find the novels totally absorbing with a lack of cinematic melodrama compensated by “a unique foray into” multiple details omitted from the series. Also, with the series giving the look of the characters I became totally absorbed by Gereon Rath and his various associates. While the series does differ markedly in plot and added or altered characterizations, I find the first three novels an absorbing read.